Maison de luxe avec piscine spectaculaire. Près des vignobles, marchez jusqu'au village! Les tarifs sont basés sur 8 personnes ou moins. Les familles plus nombreuses s'il vous plaît renseigner. Maison du designer entièrement rénovée. Il dispose de 4 chambres et plus, d'une salle de bains privative et de toutes les salles de bains en marbre. Viking cuisine avec garde-manger, deux lave-vaisselle, deux lavabos, four professionnel et sa propre salle de vin! Salle à manger séparée. Séjour avec cheminée. Outrageous Salle de jeux / film 'Man Cave' avec un énorme écran plat et plein système de son surround qui vous séduiront. (au sens propre!!!) den supplémentaires, donc il y a beaucoup d'espace pour étaler. De plus, la prime pool house avec vestiaire, salle de bains et salle de séjour! Incroyable piscine de gunite à l’eau salée de 50 pieds avec «lit de bronzage» peu profond. Super pour les enfants et les adultes. Cette maison a un endroit merveilleux. Il est proche de la plupart des meilleures attractions dans les Hamptons. Son emplacement rend l'accès à Sag Harbor, Bridgehampton et East Hampton villages en un tournemain! Le propriétaire est prêt à aider avec toutes les demandes raisonnables. Great location, well kept house, great backyard! This is actually our second stay at this property! The hosts are great and very easy to work with. The house comes well stocked with towels and spare blankets! The kitchen has every gadget imaginable. The real show stopper is the yard. The pool is great for kids and adults. The location can't be beat. Literally, a 5 minute drive to Sag Harbor village. Thank you so much for your review! We hope to see you again! Totally Chic Designer Home in a convenient area! Zachary and Nicole's house is so stylish - simply chic in every way. I especially love the kitchen and living room area, the countertops are amazing and the flow of the house is wonderful - great for entertaining. The pool and pool house are terrific and a huge bonus to come home and relax after strolling back from the village or spending the day at one of the local vineyards. All of the comforts of home are provided and the kitchen is well stocked with everything you need for a family dinner or fun get together with friends. 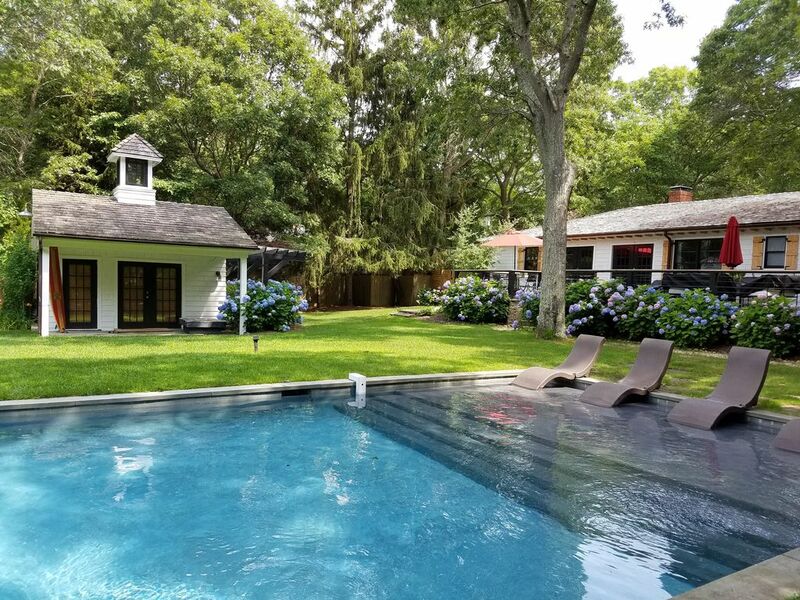 The location is terrific, so close to Sag Harbor, East, South and Bridgehampton's beaches, restaurants and farmers markets. Montauk is just a short drive away. We can't wait to book again for this coming summer. Thanks Zachary and Nicole for being fantastic hosts. See you again soon! It's a wonderful, well-decorated home and property with responsive and accommodating hosts. Convenient/short drive to great restaurants and bars. Comfortable beds and well-appointed kitchen. Unfortunately, poor weather did not allow us to experience the outdoor spaces, but it looked exactly as pictured and hope we have an opportunity to experience another time in the future. Would certainly recommend! The house fit our needs perfectly. Tvs in every room and super cute decor. This house in the perfect location for a getaway. About a mile to the downtown area and a mile to the beach. We had a great time and would love to visit in the summer. Pristine, organizing, welcoming and homey ! We my husband and I arrived the home was so pretty. Pristine condition and clean! The little touches around the home makes you feel as though you are in your own home. It was stocked with everything you could imagine. And most important to me it was comfortable! I would totally stay again. This time in the summer!! Coming Summer 2019 ! We had an amazing family vacation there. The owners were accommodating and delightful to work with. Close to town and located in a quiet neighborhood. Our stay was one of our most positive VRBO experiences!